who doesn't love tacos? they are so quick and easy to make, but have you made them with chicken before? or using a crock pot? love. love. love. 2. lift the chicken from the cooking liquid and let it cool for 30-40 minutes. reserve cooking liquid. when the chicken is cool, shred meat. 3. put the chicken back in the crock pot, mix it all up and let it soak in all the goodness of the salsa and stock, then strain the chicken and salsa into a large serving bowl. add some of the stock and salsa juices to the leftovers, however so they stay moist. 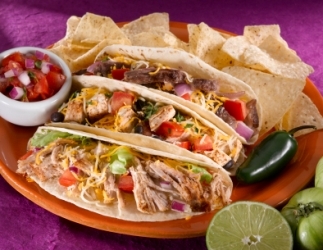 4. fill the taco shells or tortillas with the chicken and garnish with the toppings of your choice.